Got too much to do? Try delegating... to your personal assistant. 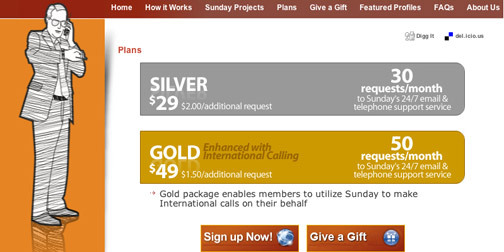 Sunday provides personal assistants via phone and internet for as low as $29 a month. That entitles you to 30 requests. Sunday says the spend about 20 min on your request and then get back to you. Requests can include travel bookings, setting up appointments, reminders or wake up calls, tracking down products or services, etc. Plus they are available to you 24/7. I might just get this for everyone on my Christmas list.